The word softail, in reference to a softail bobber in this case, is a bike that has a movable rear suspension system that has shock absorbers or springs to absorb the bumps on the roads. The springs or shock absorbers on a softail are often installed in areas of the frame so they can't be seen. This makes the softail bobber have the classic look of a bike with a rigid frame or hard tail. Why do builders and bikers want a hardtail look? Because there are many bobber 'purists' (and chopper 'purists') who believe that softails are for wimps. And a hardtail looks better to many potential bobber motorcycle owners. But there are many 'tough' biker guys and gals that prefer a softail design, especially for long hard rides. The Harley Davidson Motorcycle Company has actually copyrighted the word Softail. The term was first coined in 1984 when the company started producing the FXST Softail. The word has now expanded to cover many other motorcycles, as long as they have a hidden rear suspension they are called a softail. The classic features of a Softail bobber are created by combining classic parts, like springer forks, 5" running lamps and a fishtail exhaust pipes, with modern, newer looking elements that will make it truly custom. That's just an example. There are many classic and old school designs to model. 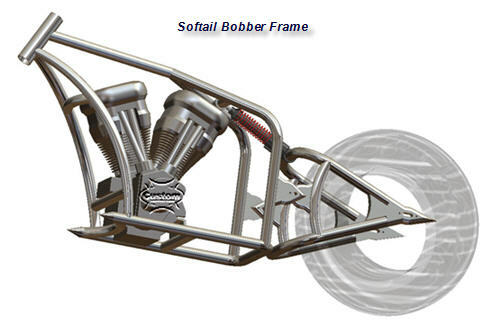 Some of the newest bobber parts are coming from Harley Davidson. They started manufacturing six new Softail models and updates to designs. Some of the new parts include a six speed cruise drive transmission, 49mm forks, and 200mm back fender and tire. Along with these new parts there will are eight new colors and combination's. If you are looking to make a Softail bobber from scratch, such as a customized Harley, parts are easy to find and install. You will be able to find such a wide range of parts to complete a total Softail or hardtail bobber from the gas tank to the chassis. You can choose to keep with the classic design or make it as custom as you wish. To really create a bobber that is unique, but still keep the classic design, mix classic parts with some modern cutting-edge design work. You can combine classic bobber motorcycle parts, such as the foot pegs, grips, handlebars made of chrome, and headlamps, with a sleek modern paint job, design of wheel, and wide tire kit. A softail version of a bobber is the ideal motorcycle to custom build because its bold classic features smoothly meld with today's edgy designs. You can get softail and hardtail bobber parts that are exact replicas of the classics or design you own. Regardless, you can bring all your ideas to life.